The Extra Long 54" Length helps protect surfaces by providing maximum coverage over a wide area. The perfect solution for complete bedding protection or for use on a sofa. Includes a heavy duty waterproof vinyl backing to protect bedding and an absorbent 7 oz. poly soaker to wick moisture away from the skin. 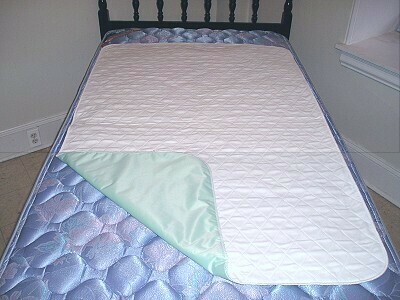 Cotton/poly quilted top sheet for a blend of softness and superior durabilty. Pad Size: 35" x 54"
Cut size is 35" x 54"; however pad size varies slightly after quilting, so actual size may be approximately 34" x 53".